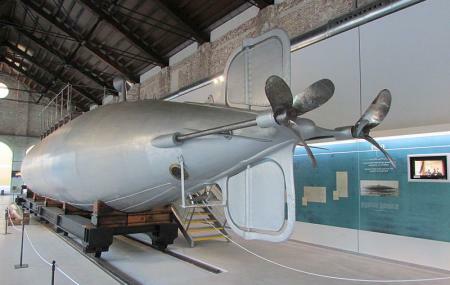 This museum is an extension of the naval museum in Madrid. Located on the port, it does not have much by the way of artifacts but it does have a fantastic collection of reconstructed boat models and cityscapes. In fact the collection is incredibly comprehensive. There are exhibitions on maps and navigation, marine infantry, the history of diving in the Navy, submarine weaponry, marine armaments, flags and uniforms, marine healthcare and an arsenal. Historical objects include a letter from Christopher Columbus, a World War II torpedo, a bullet from the attack on Cartagena in 1873, and a 1920 submarine B Italian torpedo. The building itself is historical; it used to serve as a Spanish naval hospital. Check the museum calendar for possible events. Our tour bus stopped here. There were many vendors outside wanting to sell souvenirs, etc. They were not as pushy as a previous stop, though. The museum itself was small, but the cool air felt nice. The bathroom facilities were newer and clean. There was a small snack shop with tables to sit at. Lots of diagrams of Cartagena inside and figures of pirates. Lovely tour guides, reasonable prices and nice selection of historical attractions. If you don't speak Spanish though you can expect feeling a bit lost though. There are hardly any English texts. I want to give this place more stars, but the museum is a little hokey/cheesy and quite a bit esoteric. Coupled with the fact that every single exhibit is only offered in Spanish, with the exception of perhaps an online set of movies, which I was unable to access, makes it difficult to really enjoy this place. My brain got tired of tying trying to tanslate everything from Spanish, and even my Colombian friend said that the text is a bit tiresome to them. I am a bit of a military buff, but I found this place to be overly-historical, and extremely light on guns, ships, and blowing up stuff. I visited the museum a few days ago. It was very interesting and I enjoyed meeting some of the local people there.